A retinal detachment is when the retina peels away from the back wall of the eye. The retina does not function properly when it is detached, resulting in seeing a peripheral shadow that can progress to cause significant blurring of the vision. A retinal detachment is a medical emergency and very serious. Evaluation and treatment are needed urgently as it can permanently damage your vision if the detachment is not repaired within 24 - 72 hours. A retinal tear and retinal detachment may cause a curtain or shadow to appear across your field of vision. You may see additional floaters and flashes, images may have a wavy or watery appearance. What can Cause Retinal Detachment? As we age, the vitreous gel in our eyes starts to shrink and liquify. Normally, as the eye moves, the vitreous moves around within the eye without causing any problems with the retina. However, occasionally the vitreous can pull on the retina and create a tear or rip. When that happens, fluid can enter through the tear and lift (detach) the retina off the back wall of the eye. 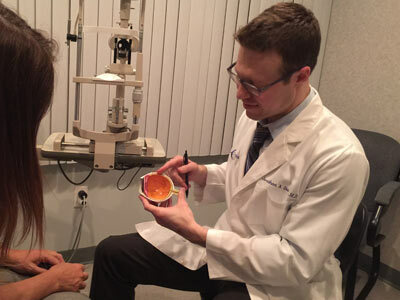 Dr. Jonathan Staman explains how the eye works to a patient. A Retinal Detachment requires urgent evaluation and treatment. Flashing lights such as seeing stars similar to being hit in the eye. New or an increase in floaters. These can look like specks of dust, lines, mosquitos/flies or cobwebs in your field of vision. A shadow or grey curtain appearing in your peripheral (side) vision. Your eye doctor will put drops in your eye to dilate (widen) the pupil. After your pupils are dilated, your doctor may perform a slit lamp evaluation. Special lenses are placed between the slit lamp and the cornea (or directly on the cornea) to view deeper structures of the eye, such as the optic nerve, retina, and the area where fluid drains out of the eye (drainage angle). A camera may be attached to the slit lamp to take photographs of different parts of the eye. This will allow your eye doctor to also examine your peripheral retina, which is where most detachments are located. 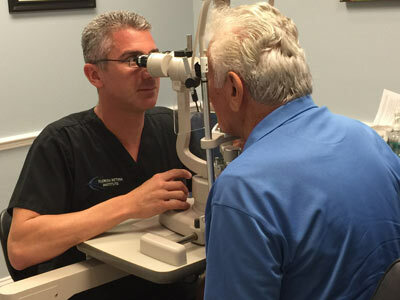 Dr. Mavrofrides performing a slit lamp examination on a patient. A retinal detachment requires surgery, either in the office or the operating room. Pneumatic Retinopexy. This procedure can be performed in the office. Your retinal specialist places a gas bubble inside your eye to act as a splint to support the retina so it can heal properly. Afterwards, you will need to keep your head positioned in a certain way for a few days in order to keep the bubble in the right place. As your eye heals, the gas bubble goes away on its own over a few weeks. Vitrectomy Surgery. This procedure is performed in the operating room. Your retinal specialist removes the vitreous gel from the eye to stop the pulling on the retina. A full gas or oil bubble will be placed in the eye to support the retina like a cast or splint so it can heal properly. The gas bubble dissolve over a few weeks. However, if an oil bubble is needed, your surgeon will need to remove it a few months later. If you have a gas bubble, you cannot fly in an airplane because the altitude changes cause the gas to expand and increase the eye pressure and result in permanent loss of vision. Scleral Buckle. A silicone band of soft plastic is attached to the outside of your eyeball behind the eyelids. It gently indents the eye inward to prevent the pulling of the vitreous gel on the retina. What are the Risks of Surgery for Retinal Detachment? Any surgery has risks, however, without treatment, a retinal detachment will result in permanent loss of vision. Cloudiness of the lens inside the eye, i.e. cataract. Scar tissue formation that can detach the retina again. Chance that the retina does not reattach properly. Your surgeon will discuss the risks and benefits of surgery. You might have some pain for a few hours after surgery. You will be given pain medicine to help you feel better. You need to rest and be less active after surgery for a few weeks. Your ophthalmologist will tell you when you can exercise, drive or partake in other activities. You will need to wear an eye patch after surgery. Be sure to wear it as long as your doctor tells you to. If a bubble was put in your eye, you will need to keep your head in one position for about 1 - 2 weeks. Your doctor will tell you what that position is. It is very important to follow the directions so your eye heals. You might see floaters and flashing lights for a few weeks after surgery. You may also notice the bubble in your eye. Over time, this bubble will decrease in size and may actually break into smaller bubbles. Your sight should begin to improve about four weeks after surgery. It could take months after surgery for your vision to stop changing. It is possible that the healing process following surgery could take a year or more. You may see flashing lights or many new floaters. You may see a shadow in your side vision. Also, a gray curtain might cover part of your field of vision. If you have any of these signs, call an ophthalmologist right away. A detached retina must be treated immediately to keep your vision.